I'll be honest with you, I was not impressed. Lacked a bit of spark and energy, everything felt a bit flat. 5/10. Oh my, the NZ anthem is a goody. A sultry smooth Maori verse hammered home by a crisp, powerful English one. 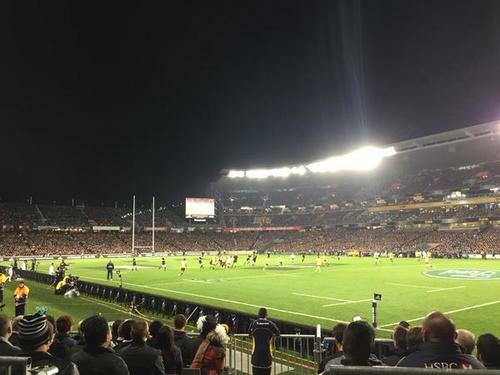 Easy early win for the All Blacks, 8.2/10. Hey Steve, please don't post updates on the Warriors here. Some of us are recording the league to watch after the ABs. Not my choice but that's how life is some days. Keven Mealamu is leading the ABs haka and he is on point as usual. 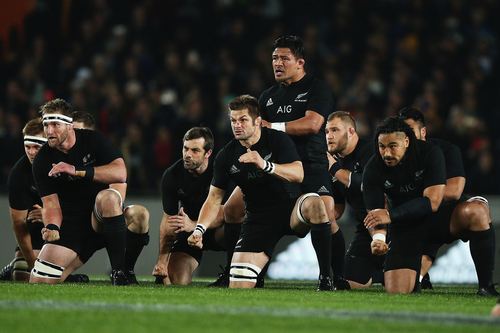 So much emotion out there as this will be the last time some of these All Blacks perform the Haka in New Zealand. 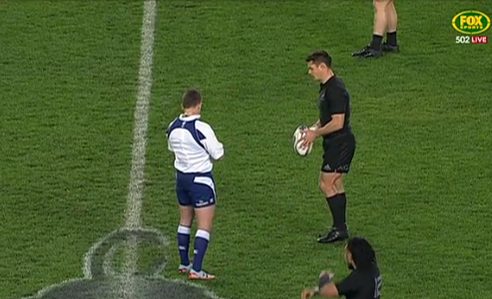 The All Blacks have the kick off and Dan Carter gets things started. It was a beauty of a kick with plenty of hangtime and Brodie Retallick nearly won it for the All Blacks but ended up knocking it on. Scrum to the Wallabies. I don't think Mealamu is quite the player he was (I might even like Elliot more than him for the sqaud), but a huge fan for a long time - Hi steven, hi from 3:30am in the US! Strong scrum from the Wallabies and they earn a penalty but the ref is playing advantage. Ref Owens comes back for the penalty. What a statement from the Wallaby scrum. Wallabies find touch just outside the All Blacks 22 but NZ have pinched the lineout. Aaron Smith does a good job of clearing under pressure and the Wallabies will try again from halfway. All Blacks have possession on their 22 and once again Aaron Smith clears well. The All Blacks quickly win back possession too but the Wallaby defence is strong. A kicking dual breaks out between both fullbacks with Ben Smith completing the phase with some quick thinking to let the ball run dead. But the Wallabies have won it back again. Plenty of quick possession changes early on. Carter hoofs one down to Quade Cooper this time, kicking from the 22 and the Aussie No.10 takes the high ball well under pressure. Cooper tests Savea with a high bomb this time and the Wallabies roll over him and win the ball back. Australia have had the better of the opening seven minutes. Penalty to Australia. Tony Woodcock pinged for not rolling away. This is well within kicking range. Cooper lines up the shot at goal from 25 out on the angle. Cooper silences the booing crowd by slotting it down the middle. Australia have the early lead. Both teams quite happy to kick and a forceback duel breaks out between Savea and Toomua. Now Carter gets in on the action but his kick just misses the Wallabies corner and dribbles dead. 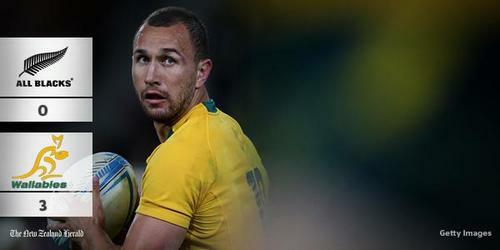 Wallabies will drop out from their 22. Penalty to the Wallabies! An All Blacks forward left his feet in the ruck. Aussie lineout 40m out from the All Blacks line. They win this one but quickly lose the ball forward. No advantage to NZ so we will come back for a scrum on halfway. Maybe too early to say this. Aus just look like a younger, stronger, more aggressive team. Pack is heavier. Average age is younger. Wonder if this ABs team is just a year or two past their best (not that they still can't be very good). Penalty to NZ! The Aussie front row collapsed. To amc: what the ABs need is a 10 capable of sparking the attack. We have four of them: Lima, BB, Slade and the injured Cruds... follow me? Carter kicks for touch from halfway and finds touch on the 22. All Blacks win the lineout but it's quickly taken to ground. Carter tries a crossfield kick but it's straight into the hands of Folau on the right wing and he calls the mark. Penalty to the All Blacks! A Ben Smith kick on halfway was deflected and the Wallabies knocked on the loose ball then conceded a penalty. Carter will take the shot at goal from about 40m out on an angle. ab forwards are too slow to get up off the ground.carter looks poor.